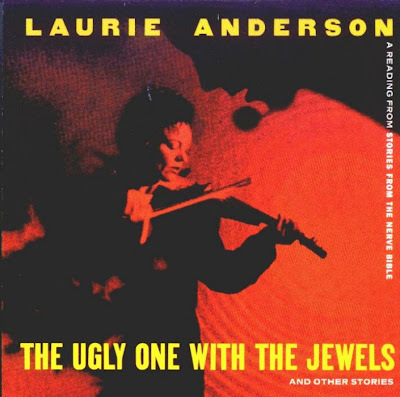 The Ugly One with the Jewels (full title: The Ugly One with the Jewels and Other Stories: A Reading from Stories From the Nerve Bible) is the title of a primarily spoken-word album released by Laurie Anderson on Warner Bros. Records in 1995, the last of her 7-album deal that she signed in the early 1980s. An immediate follow-up to her album of only a few months earlier, Bright Red, The Ugly One with the Jewels consisted of stories and monologues taken from Anderson's performance piece Stories from the Nerve Bible. Many of the pieces are autobiographical (including one in which she reminisces about working on stage with the late comic Andy Kaufman). The album was recorded live in London, England. Although most of the pieces are spoken word, they have musical accompaniment, with the exception of "The Cultural Ambassador." Two previously recorded pieces are performed again on this album: the poem "White Lily," which was earlier performed in Anderson's 1986 concert film Home of the Brave, and "Same Time Tomorrow," which closes this album just as it closed Bright Red. Discounting a greatest hits collection which followed in 2000 (Talk Normal: The Laurie Anderson Anthology), this was the final Laurie Anderson album to be released by the main Warner Bros. Records label. Commencing with her next new release, Life on a String, Anderson moved to the Warner subsidiary label, Nonesuch Records.